Underwater monitoring tools: A key requirement for offshore storage is the capability to monitor for potential CO2 fluxes underwater. An autonomous gas flow monitoring system, optimized for low cost, durability and unattended operation for 3-6 months has been developed at BGR (Germany). A prototype has been tested in Lake Constance, with two successful tests of 6 and 8 weeks in 10 m water depth above methane vents. Experience has shown that fixed, funnel-based monitoring systems are useful for monitoring single gas vents, but are not suitable for large area monitoring. The focus of BGR work has now shifted therefore to acoustic methods and mobile monitoring systems for covering larger areas. A small Remotely Operated Vehicle was purchased for mobile leakage detection under water, equipped with imaging sonar, positioning system and manipulator/gripper. 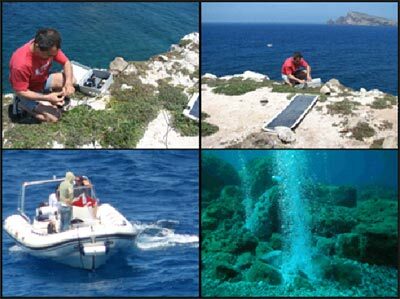 Field experiments have been carried out by the University of Rome with a prototype monitoring system, capable of measuring dissolved CO2 and CH4, water temperature and water pressure. A field test was carried out in January 2009 at the Alban Lake, which is characterized by low CO2 emissions in quiet water conditions. The system was installed at a depth of 24m and ran for three weeks with no technical problems. More recently the system has been undergoing testing offshore at Panarea (Italy), with continuous readings transmitted via the internet. Atmospheric monitoring tools: For onshore storage, surface monitoring tools such as soil gas sampling are well-established, but most are point-based techniques, deployed on some form of grid. These suffer from spatial sampling shortcomings. When covering larger (~100 m or more) area sample point spacings, localized fluxes might remain undetected. In order to address this, BGS (UK) has developed a mobile, buggy-mounted open-path infra-red laser measurement system. Both CO2 and CH4 systems have been tested in the UK and Europe. Extensive trials have been carried out at the Laacher See natural CO2 seepage site in the summer of 2007 with repeat surveys 2008. Results suggest similar results for the repeat surveys, indicating the potential for robust repeatability. The tool has now been deployed at the In Salah storage site. Integrative passive sampler: An attempt to extend the use of the integrative samplers to monitoring tracers has been initiated. Recent developments allow the possibility of passive sampling of perfluorocarbons on specific materials (type “Radiello”) and to analyze them by gas chromatography after a thermal extraction. Such passive samplers where installed at In Salah. 3 cyclic perfluorocarbons tracers were injected together with the stored CO2. Advanced seismic techniques: A number of special techniques are being tested for their applicability to CO2 storage monitoring. These include model-based inversion (by IFP France), spectral decomposition (by BGS UK), constrained AVO (by SINTEF Norway), extrema analysis (by Schlumberger France), common focus point processing (by TNO The Netherlands), and velocity-attenuation tomography (by OGS Italy). The tools are currently being tested on the Sleipner time-lapse datasets. Work of the TTC (Third Target Countries) partners (CSIR South Africa and UNLP Argentina) was directed at advanced seismic techniques. The CSIR has developed a high-resolution location method for analyzing and interpreting microseismic data called Hybrid Location. In this relocation procedure, multiple reference events have been used where cross-correlation of the energy envelopes have been used. The procedure has been improved by replacing the cross-correlation of the envelopes with the cross-correlation of the entire seismogram to improve the location accuracy. UNLP have developed procedures for the evaluation of mesoscopic attenuation and velocity dispersion in heterogeneous formations, related to the dissipation of seismic energy due to wave-induced fluid flow. 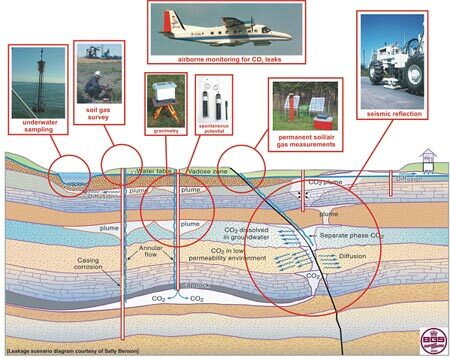 Specific applicablities to CO2 storage are being developed. UNLP have also performed a sensitivity analysis of the standard AVA coefficients (the so called A, B and C) in the near offset range, to investigate whether they can be useful to study the properties of horizontal CO2 accumulations such as saturation, pressure and temperature in the Sleipner case. Electrical imaging: A novel surface-downhole EM configuration has been designed by BRGM France, termed LEMAM. Theoretical modelling studies have been carried out which suggest that under favourable conditions CO2 plumes may be imaged. A LEMAM survey has now been deployed at the Ketzin test site. Downhole fluid monitoring: A number of novel downhole sampling and analysis tools are being developed via laboratory experiments, modelling and field testing. The BARASOL method (BRGM France) enables long term monitoring of naturally occurring 222Rn for modelling of the sub-surface gas rate and flux. The Fourier Transform Infra Red spectrometer (FTIR) has enabled more accurate detection of SF6 and perfluorocarbon tracers. 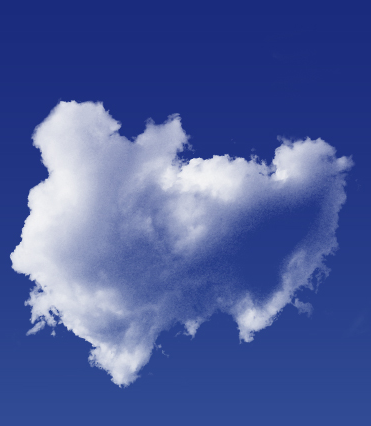 EPS has completed the adaptation of the Reservoir Saturation Tool (RST) to CO2 monitoring. Sensitivity studies have been performed on the main parameters affecting the capture measurements, i.e. salinity and porosity. It is anticipated, for example, that there will be no problem for using the tool at In Salah where reservoir porosities are fair, but not where porosity is low. Environmental corrections and tool response in CO2 monitoring mode have been obtained through measurements in a specially-built tank filled with brine-saturated sand at the bottom and with CO2-saturated sand at the top.